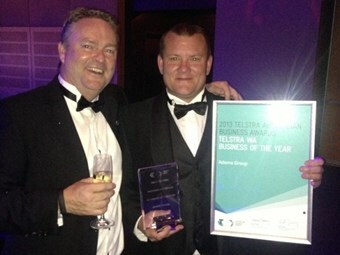 A Western Australia-wide bus and coach network, launched by a former Australian Army soldier with the purchase of a single bus, has been named the 2013 Telstra Western Australian Business of the Year. The Malaga-based Adams Group now employs 131 people operating across four different transport divisions, including coachlines and a mining service which delivers personnel to remote mine sites throughout WA. The award was presented by WA’s Deputy Premier Kim Hames and Telstra CEO David Thodey at the Perth Convention and Exhibition Centre on Tuesday night. The Adams Group, which also took out the Medium Business Award, was founded in 2005 by Adam Barnard who combined his mechanical and logistical skills gained in the army, along with tourism insights gleaned as a guide operating backpacker tours. The fleet of 88 vehicles now operates across all facets of transport including providing services for the government and tourism sectors, as well as schools and corporate events. The Adams Group is the only business in Western Australia's charter industry to run a fully equipped operations control centre using GPS to track its fleet and ensure quality customer services. Managing Director Adam Barnard attributes much of the group's success to his company's values which focus on honesty, integrity and trust between employees, clients, the community and other stakeholders. "The business has been based on raising the standards of road safety and service in the passenger transport industry, which is predominantly unregulated and historically featured high competition and low standards," he says. "We're also committed to ensuring the viability of the industry through development of more appropriate long term contracting and pricing practices." Telstra Business Group Managing Director Will Irving says the Adams Group was a great example of an entrepreneurial Western Australian business with strong management structure and operational control. "Judges were impressed with the innovative business approach of the Adams Group and its strong use of technology across all facets of operations," Irving says. "The business has enjoyed rapid growth with a clear focus on diversity of earnings and multiple future growth opportunities."